When will tobacco marketing stop ? 何日才可銷無煙 ? 31 May is World No Tobacco Day. Imposing tobacco excise tax and bans on tobacco marketing are effective control strategies for reducing tobacco demand. 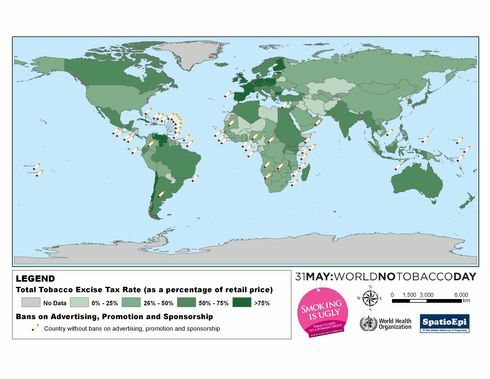 The map shows the distribution of tobacco tax rate (expressed as a percentage of tobacco retail price) by country in 2008. The cigarettes symbols indicate countries not imposing any restrictions on tobacco marketing in the same year. As depicted by graduated colours, European countries are imposing a higher excise tax on tobacco than most African countries. Besides, 50 countries, 40 of which located in Africa and America, have not introduced any restriction on tobacco marketing in spite of the growing attention on the need for control of tobacco advertisements. Tobacco is marketed both directly and indirectly. Direct marketing strategies include all forms of advertisement on TV, radio, magazine, billboard and the internet. Indirect marketing strategies refer to price discount, free distribution and sponsorship offered by tobacco companies. Complete ban on all marketing and promotional strategies is essential to protect vulnerable communities like young people and women from smoking. Protecting women from tobacco marketing is the theme of World No Tobacco Day 2010. Tobacco products are made partly or entirely from tobacco leaf as raw material. It can be smoked, sucked, chewed or snuffed. Tobacco is addictive due to its psychoactive ingredient, nicotine. Tobacco smoking is a known risk factor for many chronic diseases, such as heart disease, stroke, cancer, chronic respiratory diseases and diabetes, which are the leading causes of mortality in the world. It is estimated that tobacco usage kills one person in every six seconds, and accounts for one in 10 adult deaths worldwide. Exposure to second-hand smoking is just as harmful. According to the International Labour Organisation, 200 000 workers die every year due to exposure to second-hand tobacco smoking at work. Tackling tobacco-induced health issues remains one of the major challenges in public health globally.